The NORMA facility is located at the end position of the neutron guide No 10/1 as a complementary part of the NIPS facility. It has been designed for neutron radiography (NR) and tomography (NT), and as a position feedback for imaging-driven Prompt Gamma Activation Imaging (PGAI). 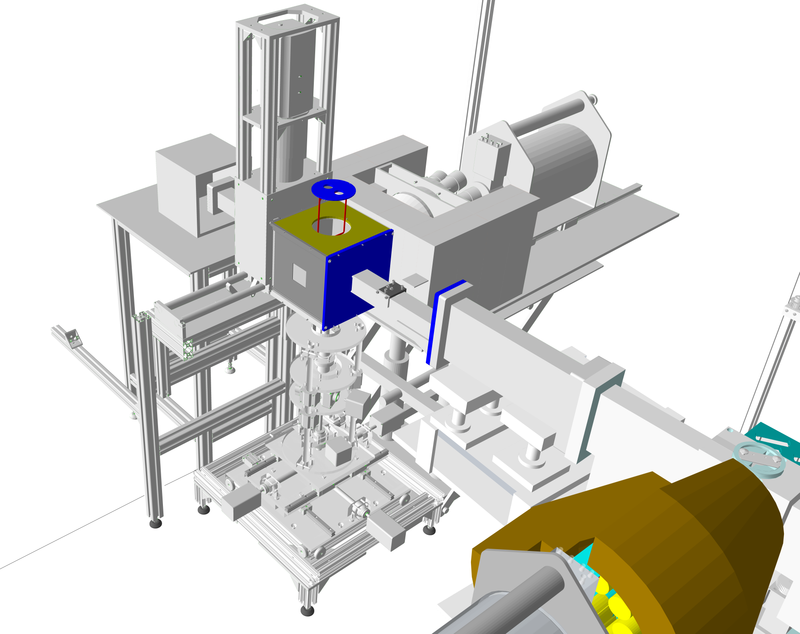 In this latter mode, the combination with the element information obtained with NIPS gamma spectroscopy detector makes possible to assign element analysis results to a well-defined volume of a large object. The beam arrives through a flight tube of 45×45 mm2 cross section into a sample chamber with dimensions of 200×200×200 mm3 for imaging and position-sensitive applications. The frame of the chamber is made of AlMgSi alloy, and lined from inside with 6Li-enriched polymer. By removing one or more side panels, larger objects (or at least parts of those) up to 5 kg weight could also be imaged (such as a sword, vase, stone, etc.). Samples can be loaded manually from the top, or placed onto an XYZω motorized sample stage with a travel distance of 200 mm and a guaranteed precision of 15 μm. The sample stage is introduced to the sample chamber from the bottom. The imaging system of the NORMA setup consists of a 100 μm thick 6Li/ZnS scintillator, an Al coated quartz mirror and a cooled, black-and-white, back illuminated Andor iKon-M CCD camera with 1024×1024 pixels and 16-bit pixel depth, mounted in a light-tight aluminum housing. The custom optics projects a 48.6×48.6 mm2 field of view (in which the beam spot is about 40×40 mm2) onto the 13.3×13.3 mm2 sensitive surface of the CCD chip. The spatial resolution of the imaging system varies between 230‑660 μm. A motorized pinhole exchanger and a graphite scatterer are installed at the end of the neutron guide, which are capable of adjusting the L/D ratio, a measure of the neutron beam’s divergence, and at the same time making the beam spot more homogeneous. The pinhole system is fabricated from a Li-6 enriched poly sheet with a neutron attenuation factor of at least 1000. It has three positions with aperture sizes of 550 mm2 (25×22 mm2, the original), 121.54 mm2 (Ø12.44 mm), 9.95 mm2 (Ø3.54 mm). There are two graphite scatterers with 2 mm and 3 mm thicknesses built in upstream, which could be positioned independently from the pinholes. The L/D ratio of the beam is now adjustable between 233 (550 mm2), 500 (121.54 mm2) and 1832 (9.95 mm2). It means that the distance from the screen where the spatial resolution is mostly affected only by the inherent resolution of the scintillation screen (about 200 µm) could be extended from 20 mm to about 100 mm. The advantage of the extended range of better spatial resolution plays an important role in the tomography of larger objects. The more uniformly irradiated field of view helps in normalizing the images properly, at the price of somewhat longer exposure times. 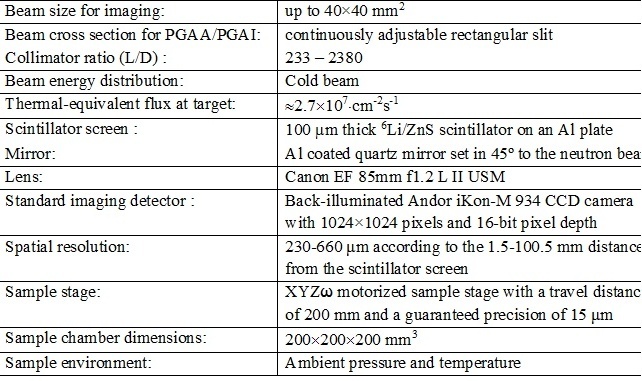 The specifications of the facility are listed in Table 1. The spatial distribution of the beam intensity is illustrated in Fig. 1a; the energy distribution of the neutrons, measured by time-of-light technique is shown in Fig. 1b. The radiography images taken at NORMA require several steps of data treatment. The spatial inhomogeneity of the beam and the thermal noise of the camera should be removed. These are called ‘beam image or flat-field correction’ and ‘dark image correction’, respectively. In tomography, the goal is to determine a measure of the interaction probability between the material and the neutron as a function of spatial coordinates. This quantity delivers the structural information about the interior of the sample. The reconstruction codes, such as the OCTOPUS reconstruction software, apply the inverse Radon-transformation and filtered back projection algorithms. The visualization of the dataset in 3D space (volume rendering) is carried out using VGStudio 2.1. Figure 1. a) The spatial distribution of the neutron beam intensity at the sample position of the NIPS/NORMA facility without the graphite scatterer and some flux values measured by gold foils; and b) the energy and wavelength distribution of the neutron beam. c) The spatial distribution of the neutron beam intensity at the sample position of the NIPS/NORMA facility with the graphite scatterer mounted at the end of the neutron guide. Szentmiklósi László, Kis Zoltán, Belgya Tamás, Maróti Boglárka, Horváth László Zoltán, Papp Mariann: Roncsolásmentes képalkotás neutronokkal és röntgensugárzással a Budapesti Neutron Centrumban, Fizikai Szemle 67/7-8 (2017) 240-244.